Seven Decades Of Hospitality Excellence. True Italian Cuisine. Unparalleled Service. Each customer is valuable and an extension of our family. Our employees deserve an environment that is mutually respectful and a place where they can flourish professionally. food are the cornerstones to a great experience. We have come to learn that without passion, the business simply does not work. With that dedication comes a deeply rooted desire to continue to grow and stretch creatively into new culinary and dining experiences both for our brands and for customers. To Create Something Timeless, Embrace Evolution. 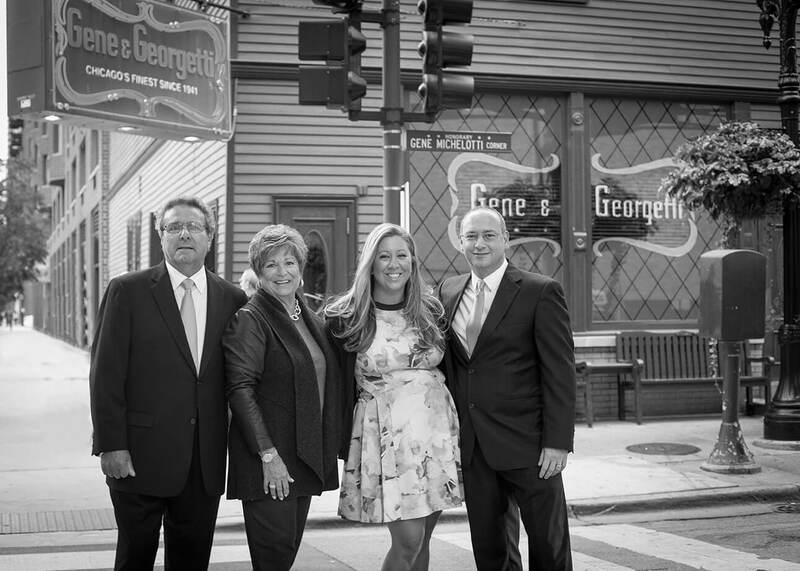 Spanning three generations, Turnkey Hospitality Group is embedded in Italian heritage since Gene Michelotti emigrated from Lucca, Italy and opened Gene & Georgetti with his partner Alfredo “Georgetti” Federighi, nearly eight decades ago. Gene’s daughter Marion, and her husband Tony Durpetti now run Turnkey as proprietors. Joining them is Marion’s cousin Richard Ciota, Managing Partner, who brings more than 30 years of experience in the food service industry, including a degree in restaurant management and culinary arts from Kendall Culinary College. Also serving as Managing Partner is Marion and Tony’s daughter Michelle Durpetti, who in addition to growing up within the hospitality industry, has cultivated a career as Chicago’s premier wedding and event planner under Michelle Durpetti Events. Together with a loyal and dedicated staff, they proudly maintain the tradition that has defined their family for decades, all while heralding Turnkey Hospitality Group for decades to come.